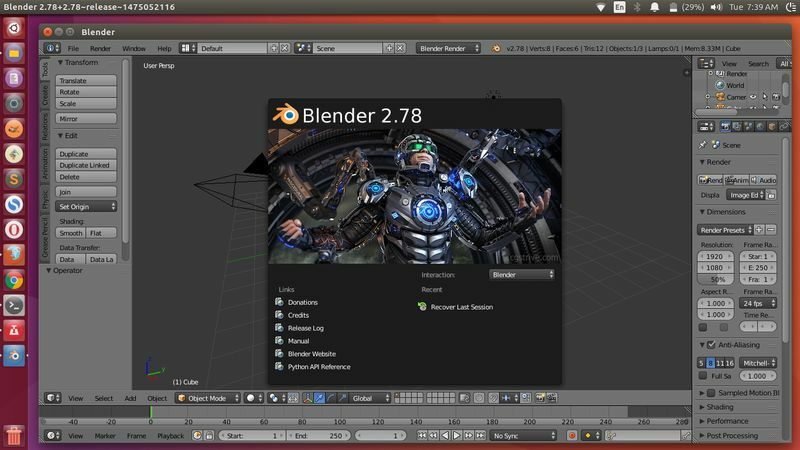 Install latest Blender in Ubuntu 16.04 LTS, Ubuntu 15.10, ubuntu 15.04 and Ubuntu 14.04 LTS - Finally, The Blender Foundation has announced Blender 2.78 in September 30th 2016 with plenty of improvements. Blender is the free and open source 3D creation suite that available for major operating system including GNU/Linux ( 32bit and 64bit ), Mac OSX, and Windows ( 32bit and 64bit ). It supports the entirety of the 3D pipeline modeling, rigging, animation, simulation, rendering, compositing and motion tracking, even video editing and game creation. Blender also comes with a built-in video editor. The video editor allows you to perform basic actions like video cuts and splicing, as well as more complex tasks like video masking. What's New in Blender 2.87? The Cycles viewport 'rendered' mode now supports more shading nodes and options and Blender GLSL viewport now supports more shading features to match the final render. Moreover, Blender Render shading can now be computed in world space rather than camera space, and the stamp metadata feature now supports hiding the labels to save space. A new freehand curve drawing tool uses curve fitting for bezier curves, with error and corner angle options, support for tablet pressure, drawing aligned or perpendicular to a surface, tapering, redo operator and calling from Python. Shapes can now be controlled directly using a series of properties. Define a "curved rest pose" for the bone, and use custom bones as their reference bone handles. There are new Add-ons e.g Blender ID Authentication, Archimesh, MeasureIt, Bone Selection Sets, Object Boolean Tools, Carver, Mesh Tiny Cad, 3d Viewport Pie Menus, Modifier Tools, Oscurart Tools, Materials Utils/Conversion. Blender 2.78 features the official Blender ID add-on, which allows you to be logged-in within Blender so that other (3rd party) add-ons can provide you with a more tailored experience. You can see a full list of full changes from the official Blender website features. Enter your password when it prompted, then press Enter to confirm. Once installed, you can now open Blender from Unity dash. These were all the Blender 2.78 and step-by-step tutorial to install or update Blender on your Ubuntu Linux desktop and derivatives like Linux Mint. If need, you can also get the Blender package ( Linux, Mac OSX, Windows ) installer from its official web. Thanks for visiting us!